Saratoga Golf and Polo hosted event on May 30. 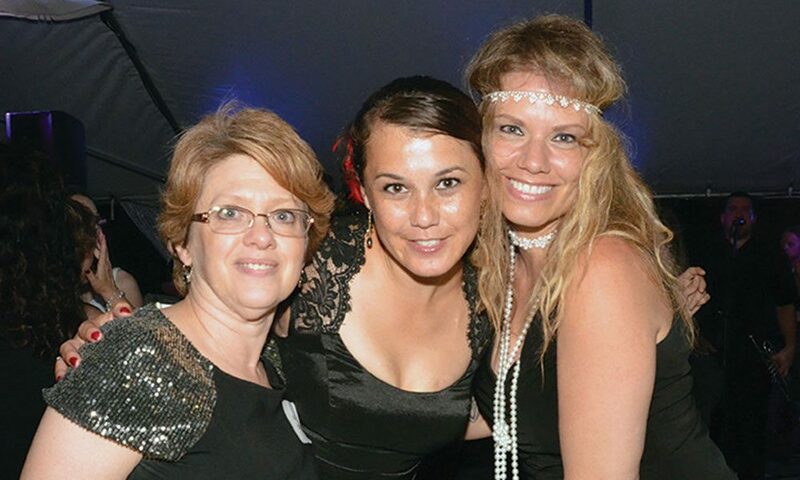 The Saratoga Golf and Polo Club took on the air of Jay Gatsby’s West Egg mansion in the Jazz Age for the Black & White Affair Gatsby Style gala on May 30. “We had 324 attend and just over 350 reservations; we were thrilled with the turnout,” said Greg Dixon, executive director of The Wesley Foundation. More than $75,000 was raised for renovations to the Springs building on The Wesley Community campus. Many guests were dressed flapper style, and a few posed in the 1932 Plymouth convertible parked out front, on loan from the Automobile Museum. Cool jazz and hot R&B from Funk Evolution kept the dance floor filled under the white tent out back. An evening shower was brief and soon forgotten. Walt Adams from The Jockey was master of ceremonies. After a video by Story Mavericks about Wesley, the dance floor was filled once again for the Heads and Tails game. Belinda Cross Kucharski, regional manager for Saratoga National Bank, won dinner for eight at the Golf and Polo Club, where John Ireland is chef. Wesley CEO Brian Nealon and CFO Shelly Amato greeted guests, who included state Sen. Kathy Marchione and Tom Lewis, her chief of staff; Assembly member Carrie Woerner; and Shauna Sutton, deputy county clerk. Primary sponsors for the gala were The Adirondack Trust Company, as well as Angerame Architects, AOW Associates, Marshall and Sterling Insurance, Fine Affairs, The Fort Miller Group, The Saratogian, Saratoga Casino and Raceway, and Ray Martin/Crescent Hill Partners.